Blockchain solutions continue to come into production. Every day brand-name companies announce they’re partnering with other brand-name companies to launch blockchain trials, proof of concepts or efforts around minimum viable products. According to PWC1, 84% of 600 executives from 15 different territories confirm that their organizations have at least some involvement with blockchain technology. 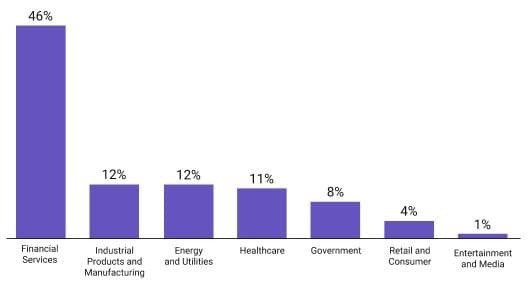 Financial services is considered to be the leading industry for blockchain development (see Fig. 1). 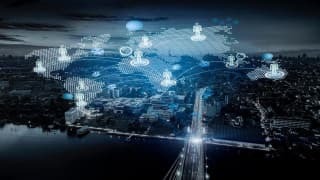 This incredible level of activity and investment confirms two key things: (1) that blockchain—or other forms of digital ledger technology—is the technology of the future, and (2) these are the salad days of blockchain, with significant hands-on experimentation needed to understand the best use cases. Gartner3 forecasts that the business value generated by blockchain will grow rapidly, reaching $176 billion by 2025 and $3.1 trillion by 2030. Blockchain is a distributed ledger recording technology. Its most important features are security (decentralization, transparency and trust, immutability), optimization and high availability. Participants of the blockchain system are interconnected via a peer-to-peer network. The main element of the blockchain technology is a distributed database that maintains a continuously-growing list of records called blocks. Blocks are the containers which include transactions. A transaction represents any change in the database. The integrity of each transaction is ensured by the use of cryptographic techniques. One of the greatest advantages of blockchain is that once a transaction is completed, it is automatically recorded and no one can change it. At Softjourn, we recognize blockchain will be a big part of our future, as we support our international client base in implementing the technology to address their business challenges. Our belief is that the best way to understand the technology is to use it ourselves, so we introduced blockchain into our corporate culture, issuing our own SJ Coins (built on Monax, a private Ethereum-based blockchain). The coins are currently used in our snack vending machines—which, with a staff of more than 185+ employees, including developers, are in constant use—and we’ll soon expand SJ Coins to underwriting social projects suggested by employees. At Softjourn, we’re living the blockchain experience. 2Tesfaye M. (2018, August 31). Financial services remains leader in blockchain development | ICO funding cools down | World Bank blockchain bond raises $80 million. BI Intelligence [Article]. 3Gartner (2018, February). Digital Disruption Profile: Blockchain's Radical Promise Spans Business and Society [Report].